Dakota Fanning (Hannah Dakota Fanning born 23 February 1994 in Conyers, Georgia), is an American actress. She starred in the movies I Am Sam, War of the Worlds, and The Twilight Saga. 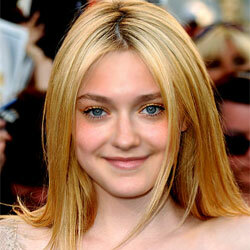 Dakota Fanning signed with AGL in 2011 and Marc Jacobs in the Oh, Lola! fragrance campaign (June 2011).